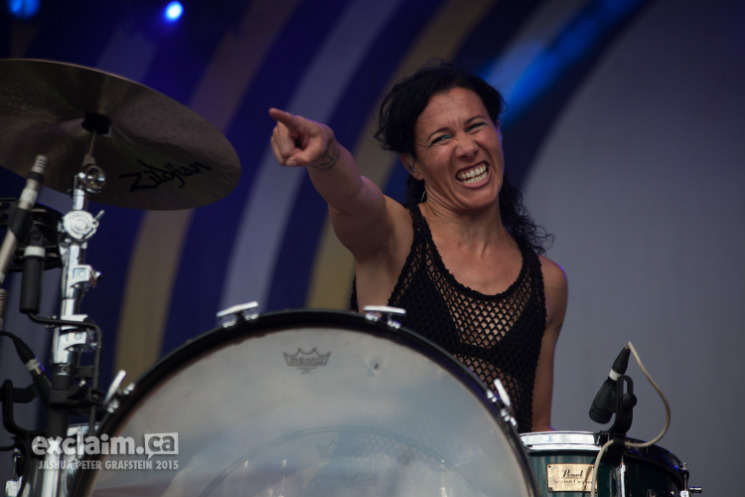 The Who's "Baba O'Riley" welcomed the ever-energetic Matt and Kim to Whistler Stage, and a brief taste of "Let Me Clear My Throat" kicked off the intensive set. Barely one track in, the duo were already a festival highlight, Kim leaving her perch behind the kit, hopping backwards onto the bass drum and pounding her snare to finish out the song. A chant of "Let's get weird!" launched the Brooklyn duo into "Hey Now" with an energy that was absolutely unmatchable. A grimy interlude of DMX's "Party Up (Up in Here)" pulled the stragglers in, Kim once again perching on the bass drum and gyrating while commending the enthusiastic crowd for bearing the unreal heat. A surge in the crowd rippled through and everyone took to jumping, the barriers literally swaying and shaking from the force. Gritty interludes every second song solidified the intense camaraderie between act and crowd, Matt and Kim blasting streamers overhead and tossing out hundreds of balloons, urging the crowd to blow them up and hold tight. Once a beefed up "Hoodie On" hit its first notes, the crowd — balloons in hand — went mad and released them all in unison, a blanket of colour temporarily overtaking the sky.